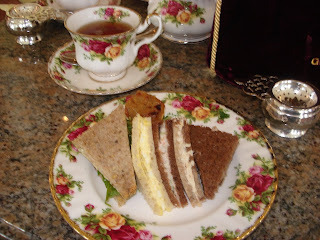 One of our favorite activities when traveling is to have afternoon tea in local tea rooms. 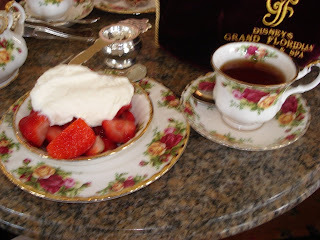 While in Orlando, we enjoyed tea at Disney’s Victorian themed Grand Floridian Resort and Spa. Entering the hotel lobby was like stepping back in time. We were greeted by the sound of classic Disney tunes being played on the grand piano. We immediately noticed the crystal chandeliers, stained glass ceilings, mirrors and fresh floral arrangements. As we walked along the outer edge of the lobby, I was fascinated by several arrangements of child-sized furniture, each consisting of a table and chairs, a small console TV and a sofa covered with teapot fabric. 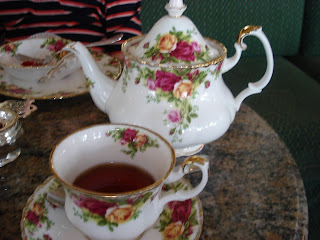 AJ, our 8 year old, chose the Mrs. Potts Tea ($10.50). He is an experienced tea drinker, but couldn’t resist the teapot of chocolate milk (called Mad Hatter tea) that accompanies this children’s favorite. His sandwiches were tuna salad, ham and cheese and peanut butter and jelly on white bread. 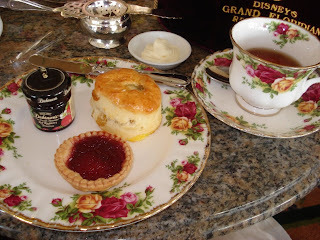 We ordered extra ham sandwiches (additional cost) for the hungry boy to wolf down while we enjoyed our second course of a raisin scone with Devonshire cream and raspberry jam and a raspberry jam tart. 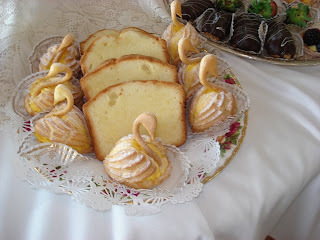 The final course was a choice of fresh strawberries and cream or a selection of freshly baked pastries. A difficult choice, but we went for the delicious fresh strawberries and cream. The 8 year old selected 2 chocolate dipped, decorated strawberries from the pastry tray. 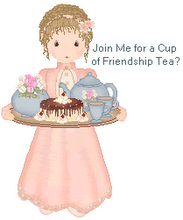 Comments from Linda: (1) I knew this afternoon tea was a big hit when on Friday afternoon GJ suggested we go back (we didn’t). (2) AJ’s chocolate and caffeine frenzy has come to a screeching halt now that we are safely home from our travels! What handsome men! And Old Country Roses china is some of my all-time favorite. This looks marvelous!